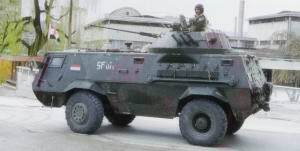 The Fahd Armoured Personnel Carrier (APC) was designed by the then Thyssen Henschel (today Rheinmetall Landsysteme and part of Rheinmetall DeTech) of Germany under the designation TH 390; Thyssen Henschel built in Germany the first prototypes of the vehicle for Egypt. Production of the Fahd is undertaken by the Kader Factory for Developed Industries, part of the Arab Organisation for Industrialisation. In the Egyptian Army it has now replaced old armoured personnel carriers such as the BTR-40 as well as the Egyptian-built Walid (or Waleed as it is called in Egypt) armoured personnel carrier. 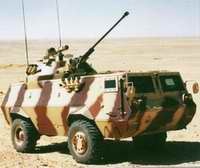 The Fahd consists of a Mercedes-Benz LAP 1117/32 truck (4 × 4) chassis fitted with an armoured body. Wherever possible, standard and proven commercial subsystems are used in the construction of the vehicle. 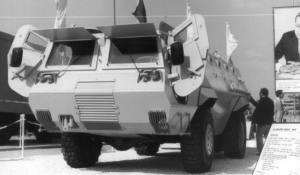 Production of the Fahd commenced in 1985, with the first production vehicles being completed in 1986 for the Egyptian Army, which is believed to have placed an initial order for 300 vehicles with an option on a further 110. By mid-2007, it was estimated that total production of the Fahd APC and its variants, for the home and export markets, had reached over 1,300 vehicles. The latest production model is the Fahd 240, details of which are given later in this entry. According to the United Nations the only export of the Fahd between 1992 and 2005 was for 53 units to Algeria. These were for use in the internal security role and used by the Gendarmerie. The hull of the Fahd is of all-welded steel armour construction giving complete protection against attack by 7.62 × 54 mm AP rounds and shell splinters. The driver sits at the front of the vehicle on the left side with the commander to the right. Both have a large bulletproof windscreen to the front, which can be covered by a shutter hinged at the top, and a side door that opens to the front. This has a window in its upper part that can be covered by a shutter if required. Above the commander's position is a single-piece, rear-opening hatch cover. The driver has a forward-facing, roof-mounted day periscope, which can be replaced by a passive periscope for night driving. The troop compartment is at the rear of the hull with the infantry entering via a door in the rear, the upper part of which folds upwards and the lower part downwards to form a step. Over the top of the troop compartment are two rectangular roof hatches hinged in the centre that can be locked vertical. The infantry sits on individual bucket seats down the centre of the vehicle facing outwards. In either side of the troop compartment are four firing ports with a vision block above so that the troops can fire their weapons from within the vehicle. Either side of the rear door is another vision block with a firing port underneath. The design of the Fahd is modular so various combinations of firing ports and vision devices are available. The Mercedes-Benz OM 366 LA 4 engine is mounted towards the front of the vehicle with ventilation for the engine and cooling system provided through an opening with armoured shutters at the front of the vehicle. The air inlet for the engine is in the roof of the vehicle. The two diesel fuel tanks are located with one either side of the vehicle. The Fahd is fitted with a central tyre pressure-regulation system allowing the driver to adjust the tyre pressure to suit the terrain being crossed. The driver can select front or rear tyres, or all together. The central tyre-pressure system stops automatically after reaching the maximum or minimum tyre pressure selected by the driver. Low-pressure, run-flat tyres are fitted as standard and allow the vehicle to travel a distance of 50 km at 30 km/h in the event of a puncture. Power-assisted steering is fitted as standard, and there is a differential lock between the front and rear axles and between the rear wheels. Up to three machine guns can be mounted externally on the roof of the Fahd for suppressive fire. Optional equipment includes a front-mounted hydraulic winch with a capacity of 5,000 kg, an NBC and ventilating system, passive night vision equipment and banks of electrically operated grenade dischargers mounted either side of the hull. 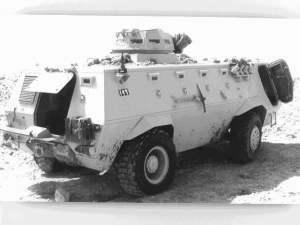 In March 1989, it was announced that the Kader Factory for Industrialisation, a member of the Arab Organisation for Industrialisation, had placed an order with a British consortium for the supply of 110 air cooling systems for the Fahd (4 × 4) APC being built for export. Galley Limited supplied the air cooling systems to Mantech Limited which shipped them to Egypt, with first deliveries made in early 1989. The Galley-designed air cooling system is a totally self-contained unit mounted at the rear of the vehicle and driven by its own three-cylinder diesel engine. The unit takes warm air from within the crew compartment, cools it in a compact vapour-cycle refrigeration system and then returns it through ducts directing the air around the vehicle. Cooling air for the radiator and condenser is drawn into the system from the surrounding atmosphere and is discharged, together with the engine exhaust cases, through louvred panels in the hull of the vehicle. The unit is sealed for use under NBC conditions. The air-cooling unit is capable of delivering more than 7 kW of power and weighs 260 kg. It has been designed to operate in ambient temperatures of up to +52°C and relative humidity up to 90 per cent, delivering dehumidified air to the interior of the vehicle at approximately +20°C. The design of the Fahd is such that a wide range of armament installations can be mounted on the hull top, for example, a one-man turret with single or twin 7.62 mm machine guns, a 12.7 mm machine gun or a 20 mm cannon. Other variants suggested by the manufacturer include ambulance, command post vehicle, missile carrier, multiple rocket launcher, minelaying, internal security and recovery. Specialised versions of the Fahd already announced include: Combat vehicle with 20 mm turret, which weighs 11 tonnes fully loaded or 9,800 kg empty, has a three-man crew and can carry 10 fully equipped troops. Police security vehicle with turret armed with 7.62 mm and/or 12.7 mm MG, same crew as above, weight 11 tonnes fully loaded. Police security vehicle with turret armed with 12.7 mm and/or 7.62 mm MG and smoke bomb launchers, combat weight 11.3 tonnes, same crew as before. Options include an air conditioning system, a night periscope for driver and commander, a wireless and intercom system, a navigation compass, a hydraulic towing winch with a capacity of 5 tonnes, an obstacle removal blade at the front of vehicle, a loudspeaker, a siren, a searchlight and a flashing light. The Fahd 240/30, covered in detail later in this entry, is the baseline vehicle for all current and future production of the Fahd range of 4 × 4 vehicles. The Fahd 240 uses the more recent Mercedes-Benz LAP 1424/32 (4 × 4) chassis with the more powerful Mercedes-Benz LA four-stroke turbocharged diesel developing 240 hp at 2,600 rpm coupled to a manual transmission. 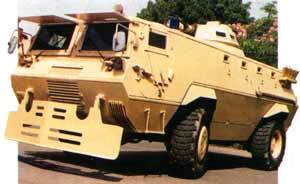 This is the basic APC without turret or weapons and can carry 10 troops plus a crew of two. This is the basic APC fitted with a manually operated turret armed with one 12.7 mm and one 7.62 mm machine guns. This has internal racking for a total of 240 anti-tank mines, which slide down a chute onto the ground. This is normally operated by a crew consisting of commander, driver and four soldiers. Optional equipment includes a five tonne hydraulic winch, driver's night vision and various armament installations plus communications equipment. This is the ambulance version, which is unarmed and has a crew of three. It can carry four seated and four stretcher patients and is provided with a full range of medical equipment. This is fitted with 2.5 tonne hydraulic crane, stabilisers and other specialised equipment. The hydraulic crane is fitted with an extendable jib, which can lift a maximum of 2 tonnes with a jib length of 2 m.
This is the baseline APC configured for the internal security role and is fitted with obstacle clearing blade, water cannon, smoke/tear gas grenade launcher and other specialised equipment. All versions can be fitted with air-cooling system dependent or independent of the vehicle, 5 tonne winch, various optical devices and communications equipment. This was announced for the first time late in 1990. It consists of the standard Fahd (4 × 4) vehicle with the roof modified. On this has been fitted a plinth, on which is mounted the complete turret of the Russian BMP-2 Infantry Fighting Vehicle (IFV). At least 58 of these vehicles have been built. Production is now understood to be completed. This version was never exported. Some modifications have been carried out to the hull. In the right side of the hull to the rear of the driver's position is an additional side entrance. The lower part folds down to form a step while the upper part with an integral firing port and vision block opens to the left. At the very rear of the hull on the right side is a single vision block with a firing port underneath. In the left side of the hull rear are two firing ports with associated vision blocks, one in front and one to the rear of the turret. The commander is seated on the right of the turret with the gunner on the left. The commander's binocular sight has a day system with a magnification of ×5 and a 10° field of view, and a night system with a magnification of ×4.2 and an 8° field of view. In addition he has a day monocular periscope with a magnification of ×1.2 or ×4 and two day periscopes, one to the front and one to the rear of the vehicle. The gunner has a day/night binocular periscopic sight with a day magnification of ×6 and a 10° field of view, and a night magnification of ×5.5 and a 7° field of view, and four day periscopes, three to the front and one to the rear of the vehicle. The two-man power-operated turret is armed with a 30 mm 2A42 dual-feed cannon, a 7.62 mm PKT machine gun mounted coaxially with the main armament and a roof-mounted Tula KBP 9K113 Konkurs (NATO AT-5 'Spandrel') ATGW launcher. The Tula KBP 9K113 Konkurs (NATO AT-5 'Spandrel') can also be deployed away from the vehicle if required by the tactical situation and has a maximum range of 4,000 m (with time of flight to this range being 20 seconds). The launcher has a traverse of 360°, elevation +15° and depression -5°. The Tula KBP 9K113 Konkurs (NATO AT-5 'Spandrel') has a single HEAT warhead and will penetrate 550 mm of RHA. In addition to the one missile in the ready to launch position, a further four missiles are carried internally, two either side of the hull. Mounted either side of the turret is a bank of three 81 mm electrically operated grenade dischargers that fire to the front of the vehicle.